The Slovak Radio Building (Slovak: Budova Slovenského rozhlasu) is located in Bratislava. It is shaped like an upside down pyramid. Architects of this project were Štefan Svetko, Štefan Ďurkovič and Barnabáš Kissling and it was completed in 1983. The project began in 1967. The building is 80 metres high and has a 522-seat concert hall with a large concert organ. The first test broadcast was made in 1984 and regular broadcasting began on 27 March 1985. 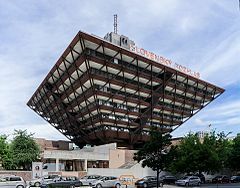 The building was included in a list of the 30 ugliest buildings in the world, but has been defended by Slovak architects.